Aquifer productivity describes the potential of an aquifer (a bedrock or superficial deposit unit that contains significant amounts of groundwater) to sustain various levels of groundwater flow and/or abstraction from a properly sited and constructed borehole. For the purposes of these maps, aquifer productivity is directly linked to the potential of the aquifer to sustain various abstraction rates from properly sited, constructed and developed single boreholes or groups of boreholes. The aquifer productivity (Scotland) Version 2 datasets are produced for use at 1:100 000 scale. The datasets are not designed to be used to assess aquifer productivity at a single point. All spatial searches of the maps/datasets should be conducted using a minimum 100 m buffer. The datasets were developed in ArcGIS using BGS digital geology linework (DiGMapGB-50, Version 5.18) at a scale of 1:50 000. A detailed explanation of the Version 1 aquifer productivity datasets is given in MacDonald et al. (2004). The Version 2 datasets described in this report were produced using updated geological linework and new information on aquifer properties made available since the Version 1 datasets were completed, and a slightly amended methodology. In particular, a study to validate the aquifer productivity classes defined in Version 1 has since been done using aquifer properties information including test pumping data, and this has informed the development of Version 2 of the dataset (Graham et al. 2009). the estimated aquifer productivity of the formation. Groundwater flows through bedrock either through small interconnected pore spaces as intergranular flow, or through fractures as fracture flow. Most bedrock aquifers in Scotland (except for some small unconsolidated Tertiary formations in Aberdeenshire) are dominated by fracture flow. Even in the most porous bedrock aquifers, such as Upper Devonian or Permian sandstones, downhole geophysical logging has shown that typically only around 20% of groundwater flow occurs as intergranular flow, the remainder flowing through fractures. However, even this minor component is significant in terms of the hydrogeological characteristics of the aquifer. Such aquifers – classified approximately as those with an average porosity of more than 20% – have been distinguished by the term significantly intergranular flow. Rocks with lower average porosity but which still allow some intergranular flow have been categorised as having mixed intergranular/fracture flow. Rocks with virtually no intergranular porosity are categorised as fracture flow. The flow characteristics and the productivity class for each bedrock formation have been classified based on information from various sources, including laboratory hydraulic testing data, downhole geophysical logs, and pumping test data, where available. However, for much of Scotland few if any of these data are available, and in these cases they are based wholly or partly on extrapolation from other similar geological units with known aquifer properties, and in the case of the productivity classifications, partly on the permeability classification of the geological unit as given in the Permeability Dataset for Great Britain (Bedrock) (Table 3). Some of the aquifer productivity classifications in the Version 1 dataset have been updated based on new aquifer properties data which have become available since the Version 1 dataset was produced. The newly assigned aquifer productivity classifications are listed in Table 1. The bedrock geology map includes a large number of small polygons representing geological outcrops of small areal extent, and long, thin polygons representing igneous dykes and sills. At 1:100 000 scale, which is the scale at which the aquifer productivity map is designed to be used, these polygons provide so much detail that the map becomes less clear and easy to use. All polygons smaller than a specified area (25 000 m2) and very long, thin polygons (any polygon more than 1000 m long and less than 100 m wide) have therefore been removed from the final map. To create the superficial deposits aquifer productivity map, each of the geological formations in the 1:50 000 scale DiGMap superficial deposits geology map was classified according to the likely productivity of the aquifer. For a small number of map sheets, 1:50 000 scale superficial deposits mapping has not yet been done, and in these cases, superficial deposits linework and attribute data at other scales, including 1:625 000 scale, were merged in. The assigned superficial deposits aquifer productivity classifications are listed in Table 2. In Scottish superficial deposits aquifers, only intergranular flow is significant, and all of the superficial deposits aquifers are classified as having intergranular flow. The productivity class for each superficial deposits formation has been classified based on information from various sources, including geophysical downhole logs, and pumping test data, where available. Where few or no such data were available, which is the case for most superficial deposits, the productivity classifications are based partly on the permeability classification of the geological unit as given in the Permeability Dataset for Great Britain (Superficial) (Table 3), and partly on extrapolation from other similar geological units with known aquifer properties. The inherent heterogeneity of superficial deposits means their properties as aquifers (e.g. permeability (reflecting the relative proportions of clay, silt, sand and gravel within many mixed deposits), thickness and lateral extent) can change significantly over short distances even within the same mapped lithological unit. For this reason, there is often a large range between the minimum and maximum assigned permeability for many deposits in the Permeability Dataset, for example from Low to High. Superficial deposits were historically often mapped in less detail and/or with less precision than bedrock. For example, on many older map sheets all glacially-related deposits were classed as till, but when the area was re-mapped using modern techniques, the same deposits were redefined to include moraine. Till typically has low to moderate permeability, whereas moraine can be dominated by gravel and sand and can be highly permeable. Hence, because across much of the country superficial deposits have not been re-mapped using modern methods, it is not generally possible to distinguish between till and moraine on the basis of the available lithological descriptions. To try and ensure the aquifer productivity map is consistent across the whole country, it was therefore decided that all till, moraine and hummocky/moundy glacial deposits would be classed as Not a Significant Aquifer, as in most cases this is likely to be true, and the deposits are unlikely to contain useful groundwater resources. It is, however, recognised that in some areas these deposits may be highly permeable, and if they are thick and laterally extensive enough, they may form local aquifers. The assigned productivity classes for the superficial deposits aquifers (Table 2) are therefore less precise, reflected in the wider range in likely yield from any particular geological unit. The actual productivity in any given area of interest will depend on the superficial deposit lithology, compaction or other post-depositional factors, area of outcrop, and thickness. In the case of marine deposits, it may also depend on the elevation of the deposit above sea level, in relation to the risk of saline intrusion. In most cases, any superficial deposit with a maximum permeability of less than moderate has been classed as Not a Significant Aquifer, while any superficial deposit with a maximum permeability of high or very high has been classed as an aquifer of either moderate or high productivity. However, in certain cases there are exceptions to this, where significant characteristics of the deposit other than permeability (for example, thickness and lateral extent) are likely to affect its aquifer productivity. These are highlighted in the notes for Table 2. DiGMapGB-50 (Digital Geological Map of Great Britain at 1:50 000) (Bedrock) Version 5.18 The main mass of rocks forming Britain, present everywhere, whether exposed at the surface in outcrops or concealed beneath superficial deposits or water. Wherever possible, they are referred to by their current name: for stratified units this will usually be lithostratigraphical; for igneous intrusions it may be a lithodemic one. More information on named bedrock units is available in the BGS Lexicon of Named Rock Units at http://www.bgs.ac.uk/lexicon/home.cfm. Permeability Dataset for Great Britain (Superficial) Version 6.0 (British Geological Survey 2010) The permeability data relate to the vertical flow of fresh water through the unsaturated geological deposits. Maximum and minimum permeability indices are given for each geological unit to indicate the range in permeability likely to be encountered, and the predominant flow mechanism (fracture or intergranular). Neither of the assigned values takes into account the thickness of either the unsaturated or saturated part of the lithostratigraphical unit. The GIS-based aquifer productivity maps, Version 1, were produced in 2004 by the British Geological Survey (BGS) in 2004. A detailed explanation of the Version 1 aquifer productivity datasets is given in MacDonald et al. (2004). 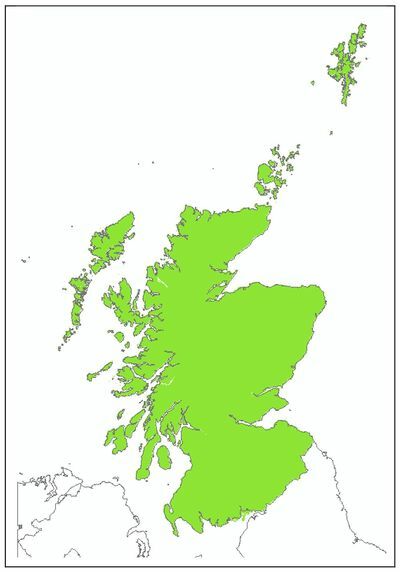 The dataset covers all of Scotland (Figure 3). The aquifer productivity maps (Scotland) Version 2 datasets are available as vector datasets with attribute values relating to aquifer productivity (Table 4, Table 1, Table 2). The aquifer productivity maps are designed to be used at a scale of 1:100 000, and not to assess aquifer conditions at a single point. All spatial searches of the maps/datasets should be conducted using a minimum 100 m buffer. The maps provide only approximate descriptions of ground conditions. They are also only a two- dimensional representation and do not reflect any changes in geological and/or hydrogeological character with depth. Use of the maps should be pragmatic, and the maps are not a substitute for detailed site investigation. The aquifer productivity maps are based on, and limited to, an interpretation of the data in the possession of the British Geological Survey at the time the datasets were created. Updates to BGS digital linework since the production of the aquifer productivity maps may have led to some discrepancies between the aquifer productivity maps and the current DiGMapGB-50 datasets. The aquifer productivity maps are subject to periodic revision, and any such discrepancies will be addressed in the next revision. ↑ 3.0 3.1 British Geological Survey. 2010. Permeability Indices (PI) data: Information Note, 2010: Permeability Index – Version 6.0. British Geological Survey Information Note. Accessed from http://www.bgs.ac.uk/products/hydrogeology/permeability.html, 11 October 2011. This page was last modified on 23 July 2015, at 16:19.